A few months after being honorably discharged from the military, Jackson Hunt is still struggling to adjust back to the real world. He needs to get a job and find a sense of normalcy if he’s going to keep his own demons at bay. The job that falls into his lap, though, is anything but normal. Bodyguard (and baby-sitter) to spoiled-rich-girl Kelsey Summers isn’t exactly what he’d been looking for, but it’s a chance to travel, to get away from the home that has felt stifling ever since his return. It would be a pretty sweet gig if it weren’t for the fact that Kelsey’s father doesn’t want Kelsey to know she’s being followed. Hunt feels guilty (and a little bit creepy) as he watches her from afar. She’s vibrant and infuriating, exciting and reckless, mysterious and familiar. When he sees her falling into the same patterns that he suffered years ago, he decides it’s time to stop watching and help her instead. But getting to know her is more difficult than he thought, especially because the more he knows her, the more he wants her. I have been a huge fan of the Losing It Series by Cora Carmack; snatching all of the books up and then devouring them as soon as they are on my Kindle. I absolutely loved Jackson and Kelsey's story in Finding It, and was anxious for an encore. To say I was excited by the revealing of Seeking Her, told exclusively from Jackson's point of view, is putting it mildly. In Finding It, we got the whole story told from Kelsey's point of view after meeting Jackson and falling for him. I couldn't wait to learn more about Jackson as a character, as well as hear his thoughts and observations regarding Kelsey. 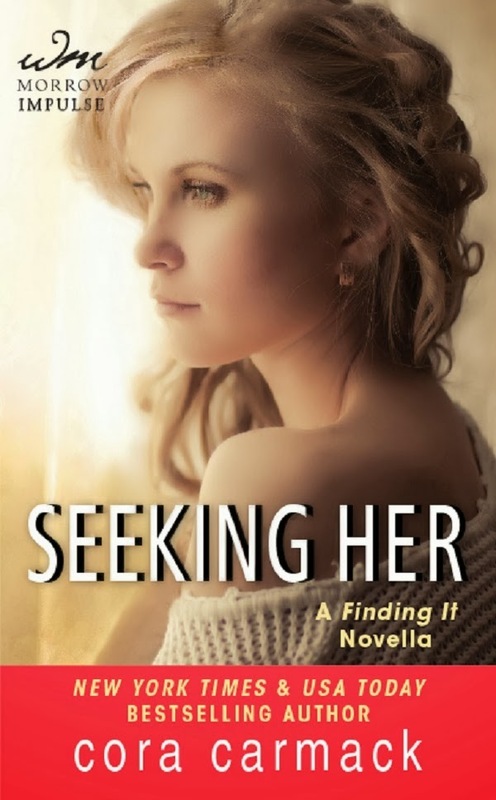 For me, the pacing in Seeking Her, went really slow. Since this is a novella, I thought I would breeze through it. Instead, I found myself putting it down a lot. I loved Jackson in Finding It, so naturally I enjoyed Seeking Her. However, it felt more like a reread to me than a new story. I loved seeing how Jackson felt protective of Kelsey right away. He connected with her, because he saw his old self in her. The one who drank excessively and went to great lengths to try and dull the emotional pain that he was in. He was also really attracted to her and had to keep reminding himself that this was a job for him. These thoughts and feelings took up two-thirds of the story, and it didn't seem to move that much till the last third, when Jackson stepped out of the shadows and started interacting with Kelsey. Then, the plot really started to pick up, and I was speeding through the story! Finally, I was getting to the good stuff; the attraction, hot chemistry, and sweet romance between Jackson and Kelsey, the confiding of secrets, and getting to know each other on a deeper level. Then, abruptly, the story ended. I thought I was missing something, and kept flipping through my Kindle, but no, the story had officially ended. My reaction was frustration and confusion. Where was the rest of the story? So, to sum up my overall thoughts, I love Jackson. I enjoyed getting inside his head and learning more about his thoughts and observations concerning Kelsey. We get a little bit of information about his past, but I would have liked to learn a lot more about his family background, past experiences, and what made him turn his life around. The story was a bit redundant, and didn't bring a whole lot of "new" to this novella. Things speeded up, and then ended abruptly. I'm going to give Ms. Carmack the benefit of the doubt (since she is one of my favorite authors,) and guess that maybe this novella is a to be continued... I give Seeking Her, by Cora Carmack, 3 Attraction, Chemistry, and Jackson-Filled Stars! I have read the first book, Losing It, and I really did like it. I hope to catch up soon. I'm glad you enjoyed this, even though it was missing some things for you. Abrupt endings always frustrate me. Great review. I have read only the first book, Losing it, and I loved it. I was looking for the second book, Faking it, but I can't find a paperback here in Ireland, so I'm waiting. I liked your review and I don't know if it's me, but sometimes I am not really keen on novellas, because if they don't give me a new side or part of the story I'll get mad..it doesn't always happen though. I agree Mary! I prefer a novella that brings something new to the "story." Thank You for stopping by! I need to catch up on this series! I generally like novellas, but I've seen a few reviews that say it's good, but not a must-read. Thanks for the review, Lindy! Thanks for stopping by Andrea! I've been putting off reading these books waiting for a good time to read them. I need to pick them asap although I may pass on this novella. I've pre-ordered this and I am looking forward to reading it. I loved Jackson. Great review. While this wasn't a fav for you I am anxious to read it. I bought Finding It on release day and hope to get to it soon. Wonderful review Lindy! Nice review Lindy, but it is a shame it wasn't as good as you hoped. I don't like it when a plot doesn't grip you like you hoped it would. I will still read this because I do love Jackson!! Great review, Lindy! Too bad it didn't fully live up to your expectations :( I hate it when that happens. Thanks Lexx :) You too!